Radio frequency integrated circuits (RFIC) are helping to revolutionize the ways people communicate and use information. 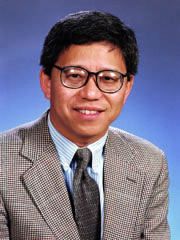 Kenneth O, a professor in the Department of Electrical and Computer Engineering, is a leading researcher and teacher in RFIC. His research group, Silicon Microwave Integrated Circuits and Systems Research Group, is striving to increase applications of low-cost silicon IC technology for the frequency range between 1 and 100 GHz. The hope is to bring the benefits of the communication technology to a larger segment of the population by reducing the cost of communication devices. “Presently, the group is developing radios which can work with all the widely utilized commercial radio standards between 900 MHz and 5.8 GHz,” O says. The group, in collaboration with Motorola Labs, is also developing a true single-chip radio, which integrates antennas, radio transceiver and digital base band circuits, and a micro-controller.